My husband doesn’t cook much so the meal preparation will be up to me. That’s okay by me as long as he does the dishes! I haven’t decided what we’ll make for Mother’s Day brunch yet but we’ve been trying some delicious egg recipes from the Eggs.ca website. Eggs are such a nutritious choice and when I buy from Canadian egg farmers, I know I’m buying fresh, local, and high-quality eggs. Did you know that one large egg is 70 calories and has 6 grams of protein? It’s no wonder why so many people choose to start their day with eggs – that protein will help keep you energized all morning! Not only are eggs high in protein but they provide 14 essential nutrients that are good for your bones, teeth, skin and eyes. I know some people skip the yolk thinking that it’s a healthier choice but did you know that most of the egg’s nutrition is in the yolk? Here are some great facts on Egg Nutrition from the Egg Farmers of Canada. Whether you’re looking for classic white or brown eggs, omega-3 or organic, or free range, the Canadian egg farmers provide all of these options. While browsing the recipe section on Egg.ca, I came across a Kentucky Scramble recipe that I knew my family would love! It’s loaded with healthy eggs and vegetables and it includes something my husband can’t resist – bacon! I made this recipe for a weekend brunch and we had enough left over for supper. I love the addition of cream cheese. I wouldn’t have thought of that for a scramble egg dish. This tastes just as great for leftovers the next day! Add peppers and onions to frying pan and cook for a few minutes until vegetables have softened slightly. Add bacon, corn and cream cheese and stir well to mix. Continue cooking over medium-high heat until cream cheese has melted. In a medium bowl, whisk eggs, salt and pepper and then pour into frying pan. Cook on medium heat until eggs are set. This dish goes great with baked breakfast potatoes. I’m also trying to perfect the omelette but my technique could use some practice. I tried the Greek Omelette recipe and it was so delicious. I loved the addition of feta in an omelette! I have an egg-citing giveaway to tell you about! Between now and May 6, 2015 (11:59 p.m.), you can enter to win one of three prize packages with a total prize value over $1000! 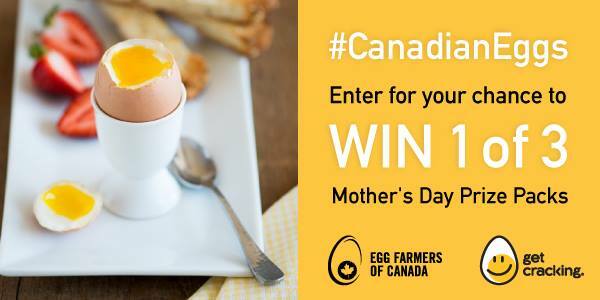 Be sure to like the Egg Farmers of Canada on Facebook for delicious recipe ideas, follow @eggsoeufs on Twitter for exciting contest details and helpful tips and follow them on Pinterest for healthy & fun meal ideas. This looks fantastic, love this Kentucky Scramble with all of it’s goodness!! I love doing overnight french toast for special breakfast occasions. My mum and I have started eating eggs, every day. She has a pretty basic pallet, but would enjoy the Kentucky scramble minus the cream cheese! Overnight french toast – easy and delicious. Baked blueberry/strawberry stuffed French Toast. So good! My fave is a breakfast bake. Veggies and ham egg white omelette! This recipe looks amazing! I love eggs 🙂 So versatile! A nice spinach, mushroom and bacon quiche would be lovely for Mother’s Day! A spinach and mushroom omelette! My husband makes killer omelets with Boursin garlic cheese, mushrooms and bacon. My favourite egg recipe is crepes. I add fruit or syrup to it as well. I love a Western Omelette but I think I would love to try the Kentucky Scramble! My favourite egg recipe is an egg bake with bacon, hash browns, and cheese. The Kentucky Scramble looks really good! french toast has always been my favorite, but I’m going to try Kentucky Scramble- it sounds good. Lightly brown slices of back bacon, poach eggs, toast English muffins, make blender Hollandaise. Assemble and pretend it took hours. I like a cheddar omelet, hash browns, crisp bacon and coffee. This is my ideal brunch. Pancakes with Chocolate Chips and whipped cream! Eggs Benedict and a glass of nicely squeezed orange juice. I would make a strada! kentucky scramble looks so good! Breakfast Casseroles of any kind are my favorite! French toast or scrambled eggs. My favourite would be spinach omelets. easy meal of scrambled eggs with cream cheese, cheddar cheese and sauted peppers & onions. Accompany it with a warm gluten free cinnamon bun–YUMMY! These recipes look good. Overnight oatmeal is another great breakfast option. Sunny side up eggs, with buttered yellow toast. It was the way mom always made eggs for me, and it makes me happy when I eat it 🙂 Plus, I love dipping my toast!! Just plain basted eggs and toast. 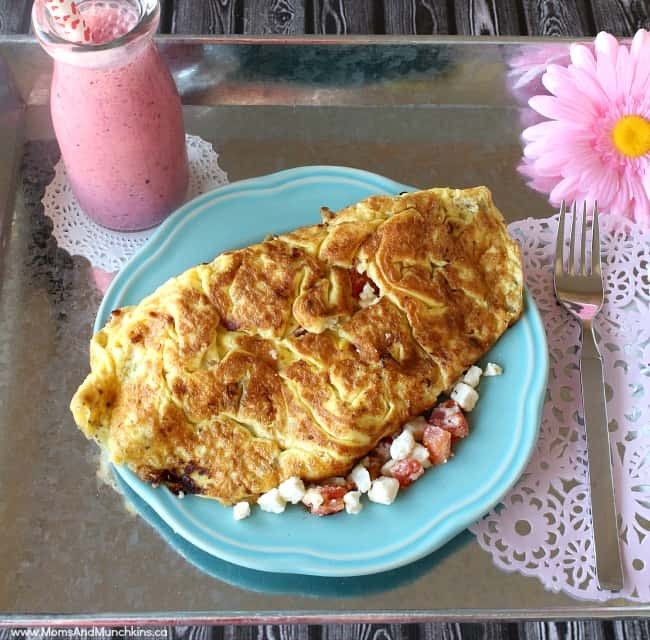 As a mom who works out and watches what she eats these omelette recipes are fantastic! Yummy! I love making a quiche for mothers day breakfast. So many great ingredients u can add! I love omelets…My husbands makes the best bacon, broccoli and cheese omelet. My favorite Mother’s Day recipe is a casserole made with layers of bread, eggs, ham, milk and cheddar cheese. 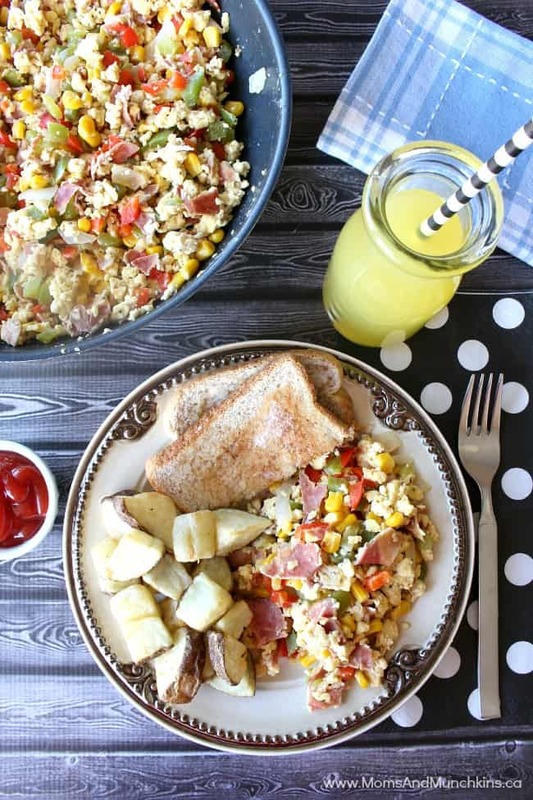 I’m going to try this Kentucky Scramble — looks delicious! Just had a broccoli omelet for breakfast! Baked ham cups filled with eggs and thyme & rosemary and when baked, topped with bernaise sauce! I love my moms Egg Omelet with milk, goat cheese, peppers, and mushrooms. So good! Scrambled eggs with ham, green onions and red pepper. My favorite Mother’s Day recipe is Ham & Cheese Quiche! I love eggs Benedict or a mushroom omelet!